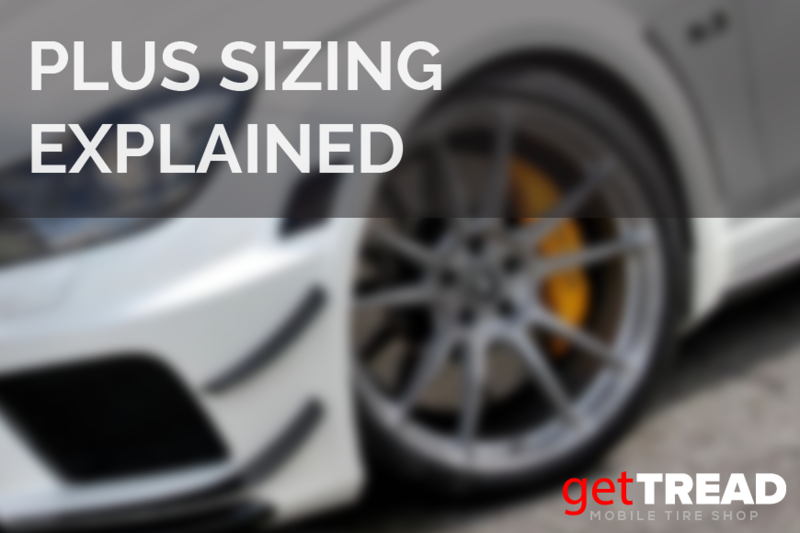 If you’re new to cars, or it’s your first time buying wheels and tires – you may have heard the term “plus sizing.” Keep scrolling to find out the details on why we do it, and how it’s done. Getting bigger and more stylish wheels with low profile tires can be a great way to dramatically change the character of your ride and achieve that upgraded, unique look. As an added benefit, by decreasing the sidewall height (by lowering the aspect ratio) the wheel and tire assembly becomes less compliant (less squishy) – resulting in sharper handling/quicker response in most cases. *If you’re not quite sure what aspect ratio means, pop over to our quick blog post on How to Read A Tire – Part 1 of 2 for a refresher. HOW DO I PLUS SIZE? Plus sizing basically means buying wheels that have a larger diameter (measured in inches) than factory specification – but then decreasing the tire side wall height by lowering the tire aspect ratio. Take a look at the diagram below, and notice that the overall outer diameter of each scenario stays almost the same. For accuracy of the vehicle’s speedometer reading, you want the new outer diameter to stay within 3% of factory spec. There is a risk associated with plus sizing, namely – accidental encounters with potholes, curbs and debris on the road. So, once you’ve got plus sized wheels and tires, you’ll need to take extra care. And surprisingly, wide tires tend to float on loose surfaces and cannot process water as quickly as narrow tires. From a physics perspective, it’s about Force over Area (or pressure). The same force over a larger area = less pressure (pounds per square inch). Less downward pressure onto a surfaces like snow and water soaked highways may lead to reduced traction and hydroplaning. Lastly, the maximum wheel and tire plus sizing applications for trucks and SUVs may result in wheel/tire combos that are significantly heavier than the vehicle’s original equipment. Slower acceleration, longer stopping distances, increased suspension and brake wear may result. Plus sizing is a great way to make your ride more unique. Need help finding the right plus-size wheel and tires for your needs? Contact Us by email or use the Live Chat feature on the bottom right of your screen. Already know what tires you need? Jump over to our tire shopping link. You’ll enjoy less shopping hassle – with our innovative “Driving Style” filter, you can zone in on the best tire for your needs – and of course – we COME to YOU! Happy shopping!